"Nothing can be said to be certain, except death and taxes," Ben Franklin famously said. In today's growing mobile world, you can add turning off your electronic device during takeoffs and landings. It's just part of the hassle of flying. But that could all change, according to Yahoo. The Federal Aviation Administration is reportedly "exploring ways to bring together all of the key stakeholders involved" to determine whether devices like tablets, e-readers and music players are safe to use during critical phases of flight. Cell phones, including smartphones, won't be part of the discussion. 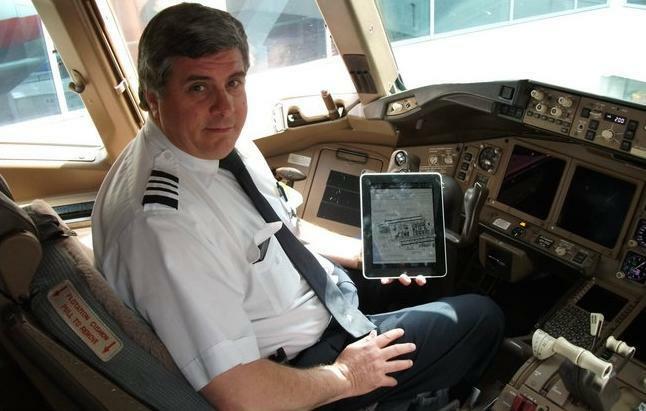 Current FAA rules require passengers to completely turn off all electronic devices while below 10,000 feet, but it seems the rules may change due to the advent of products like the iPad. Airline testing hasn't explored this area since 2006, long before the iPad was introduced. Concerns against using mobile technology on flights during certain periods say there could be an "additive effect" of a planeload of 200 passenger using their device at once versus one passenger using a device solitarily. Planes constructed beyond the 90s have been fortified with shielding built into their wiring and other electronic equipment, but concerns remain over levels of electromagnetic interference. "With the advent of new and evolving electronic technology, and because the airlines have not conducted the testing necessary to approve the use of new devices, the FAA is taking a fresh look at the use of personal electronic devices, other than cellphones, on aircraft," said Laura J. Brown, deputy assistant administrator for public affairs for the FAA. The FAA has acknowledged this is an issue of great concern for consumers, but "no changes will be made until we are certain [devices] will not impact safety and security." In order for devices to get cleared, an airline is required to test each version of a single device on every single plane before it can be approved. Conflicts between passengers and cabin crews have become more prevalent with the spread of mobile devices. Late last year, the issue came to a head when actor Alec Baldwin was booted off an American Airlines flight for refusing to quit his game of Words With Friends.